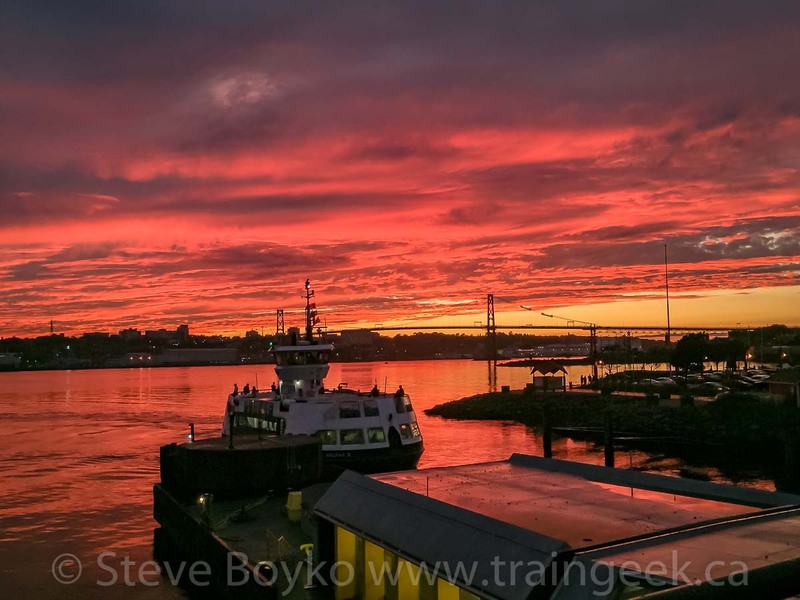 I was in Halifax, Nova Scotia for a quick trip in October 2017. After work I arranged to meet up with Caleb Wentzell to see CN 121 at night... but before that I decided to visit the CN Fairview yard in Halifax to see what was going on. The light was fading but there was still enough light to see that CN 121 was going to have five locomotives. Note the turntable in the foreground, still used to spin a locomotive or two. 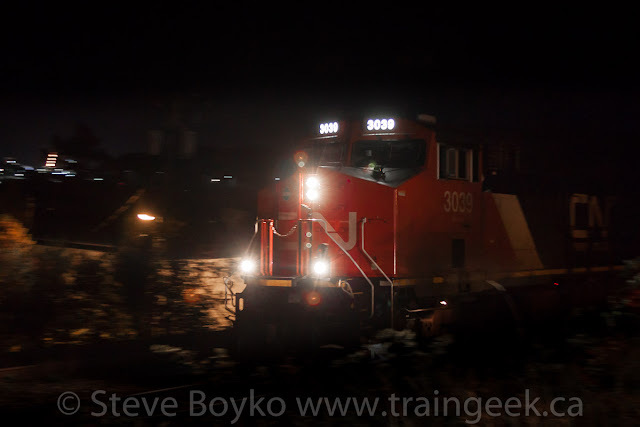 The consist was going to be CN 3039, CN 2549, CN 2316, CN 8801 and CN 3042. 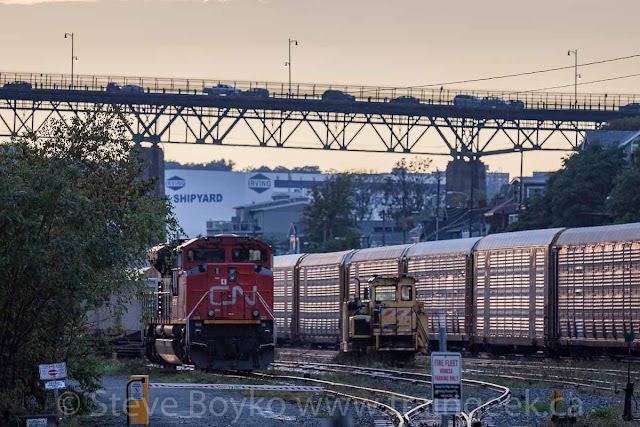 CN 120 and 121 are the daily container trains serving Halifax. CN 120 typically comes into Halifax early in the morning and CN 121 heads west in the evening. 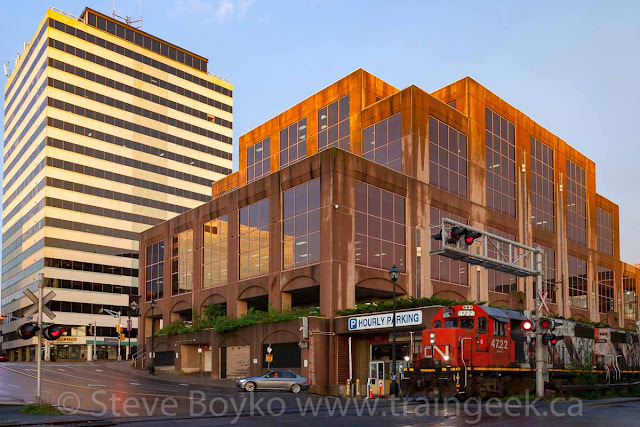 In between, the locomotives rest at the Fairview shops where they are fueled and serviced for the long trip back to Montreal via Moncton. In times past, the Fairview shops were very busy with servicing all the RS-18s and RSC-14s and other locomotives serving the many branch lines. These days, it is much quieter. Fairview is a stub ended yard. 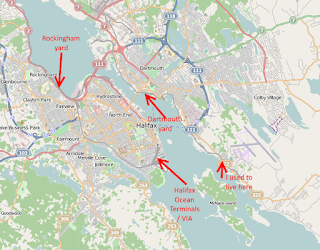 It is located next to the tracks leading to downtown and the Halifax Ocean Terminals (HOT). As always, do not trespass! 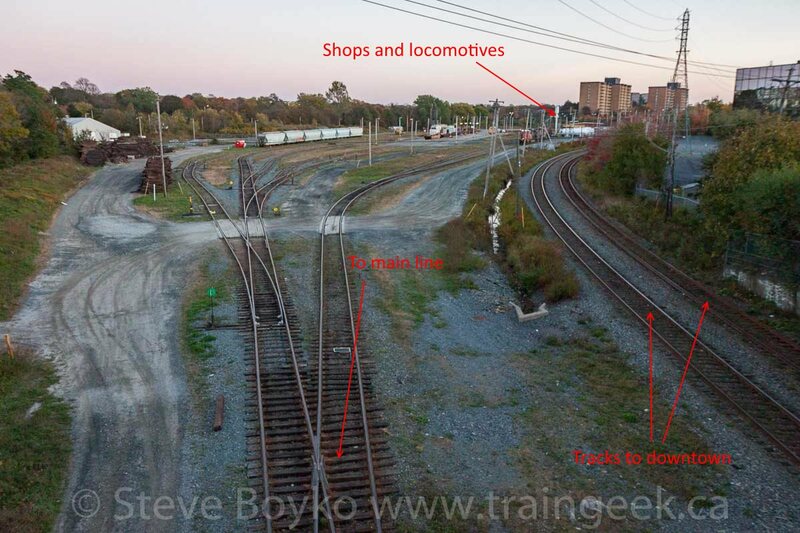 CN has a big problem with people cutting through the Fairview shops, and crossing the tracks leading to HOT. No photograph is worth risking your safety or security. When CN 121 is ready to roll, the crew takes the locomotives over to Rockingham and connect onto their train, which has been prepared during the day by the switcher crew. Often they have to "double" their train by putting two or more tracks of cars together before departing west. 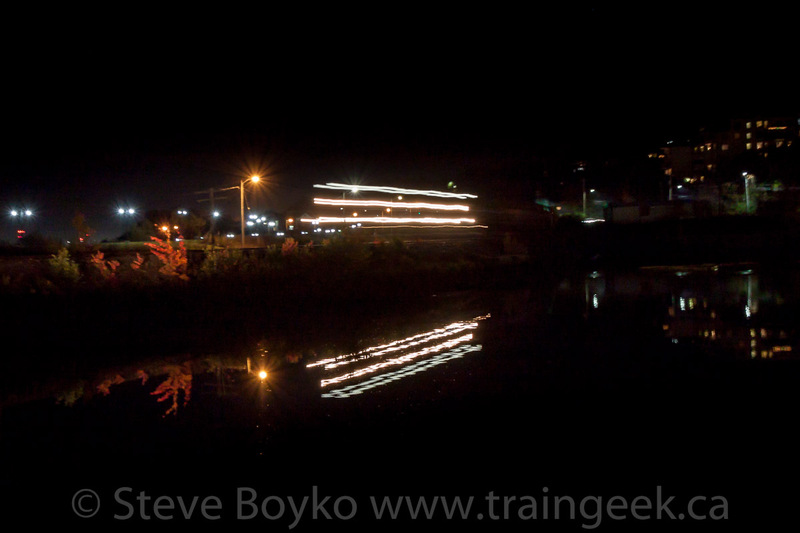 I felt that the light was good enough that I could photograph the locomotives departing Fairview. I decided to try for an overhead view. Highway 2 crosses over the "mouth" of Fairview yard and I thought there might be a shot there. I had never tried it before, but why not give it a shot? I left my car parked on a side street near the Fairview yards and walked through the Fairview Lawn Cemetery, paying my respects to the section of the cemetery where many of the Titanic victims are buried. 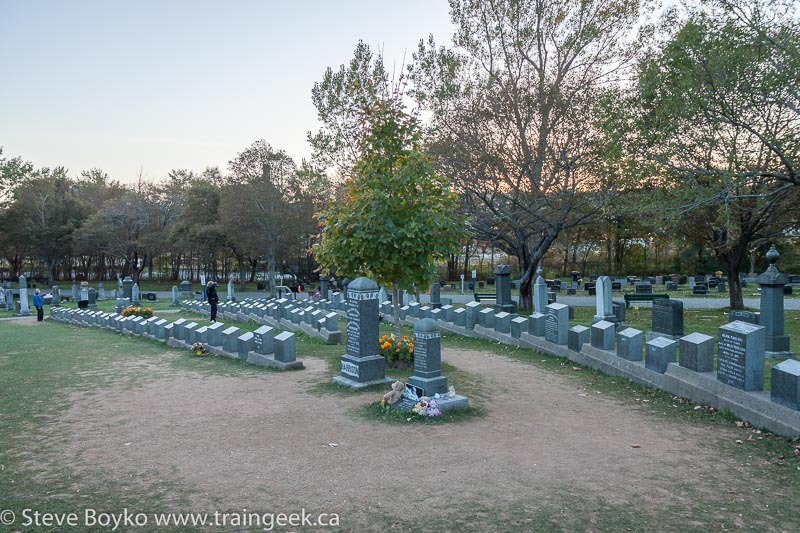 I got to highway 2 and found that the "on" ramp from Joseph Howe Drive had a sidewalk on the right side, with a nice view of the yard. As you can see, it was starting to get dark. The sun had already set and the light was fading. I switched my camera to ISO 400 - as far as I dared without getting too much noise - and waited. Soon the headlights came on and they rolled forward... and stopped. Nice! It turns out they had to line a switch. The conductor popped the front door and went to line the switch, then came back to the locomotive. They still didn't move... because a transfer freight had to roll by en route to Halterm downtown. 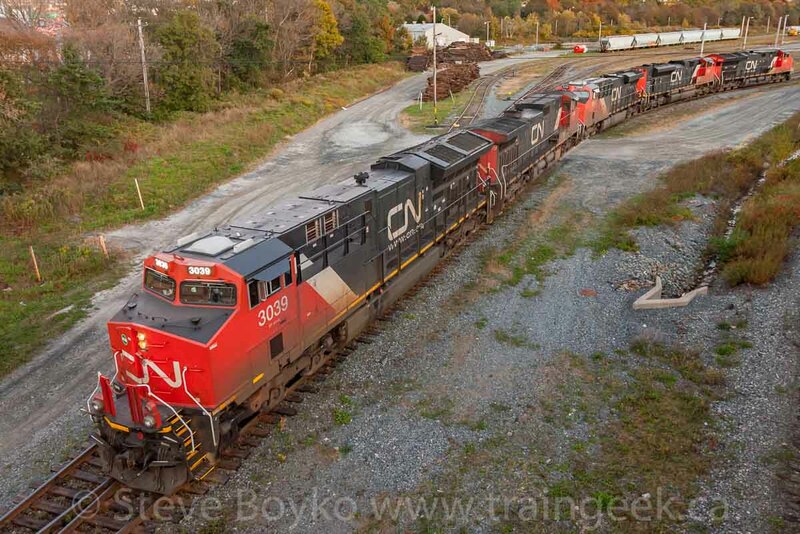 CN 9574 and 9531 rolled on past with container flats in tow. 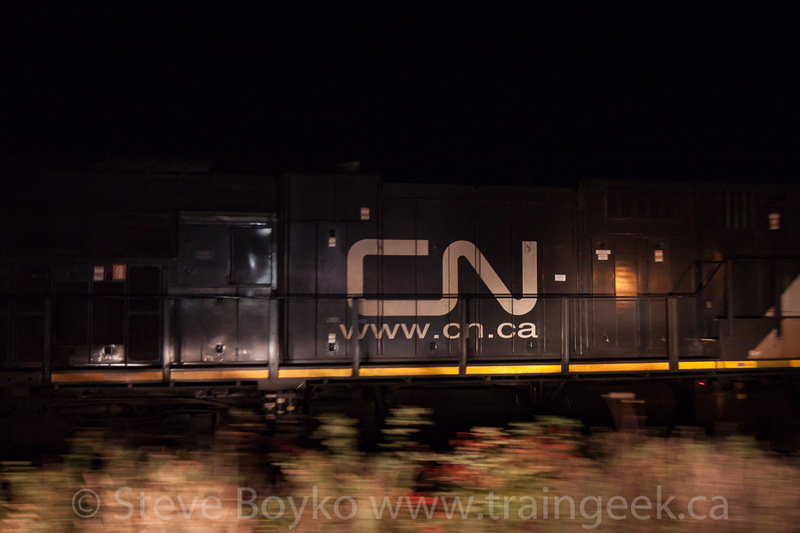 Once they passed, the CN 121 power carried on to Rockingham Yard. 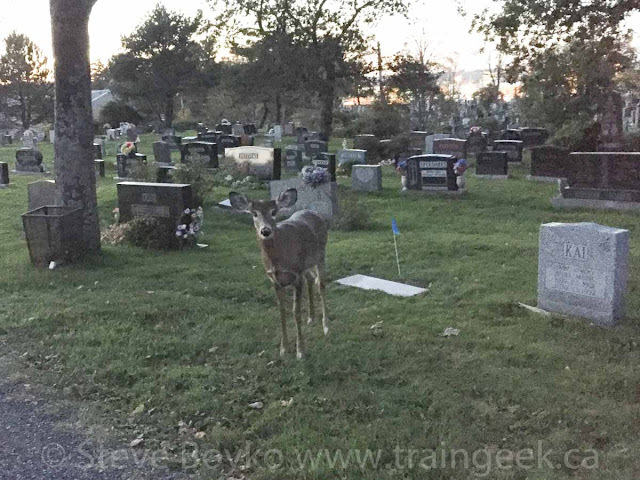 On my way back to my car, I made a friend in the cemetery. We startled each other a bit... but the deer was very curious and not really afraid of me, which was unfortunate. I think it means that somebody has been feeding it and that's never a good idea. It kept looking at me and edging closer, so I just turned around and left. 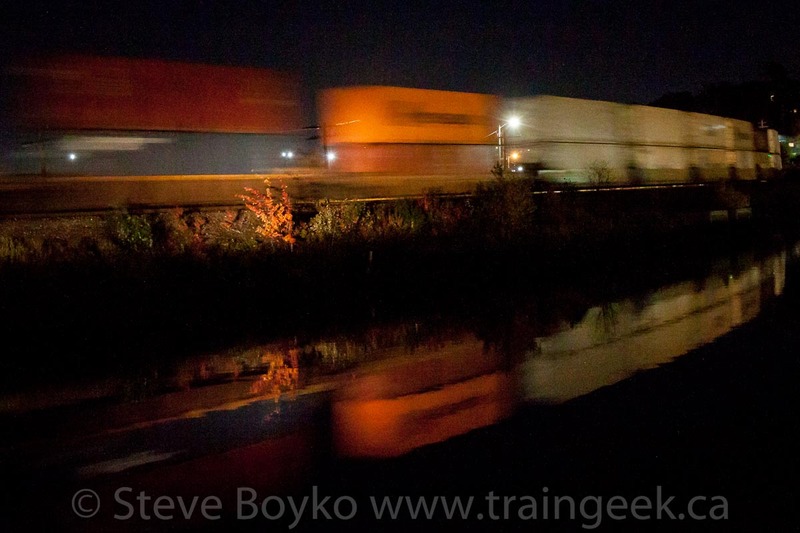 I met up with Caleb and we went down the Bedford Highway a bit to catch 121's departure. I took a little pan as CN 3039 rolled past. We drove ahead a bit to Mill Cove, where there's a nice curve. In the daylight it is nice, but at night... well, I did my best. So that was CN 121. It was nice to meet up with my friend Caleb again. A little extra... I was actually in Halifax in September as well, for a series of meetings, and while in downtown Dartmouth I caught a CN local train returning from Shearwater. 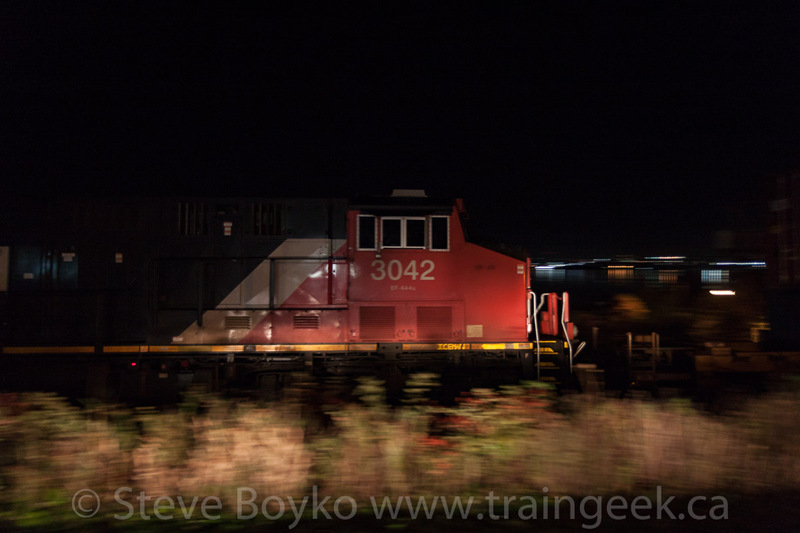 Tired Geeps CN 4722 and 4769 were pulling a bunch of autoracks from the Autoport out Shearwater way. It turned into quite a stunning sunset. On another evening, I saw CN 9531 doing some shunting in Rockingham Yard. 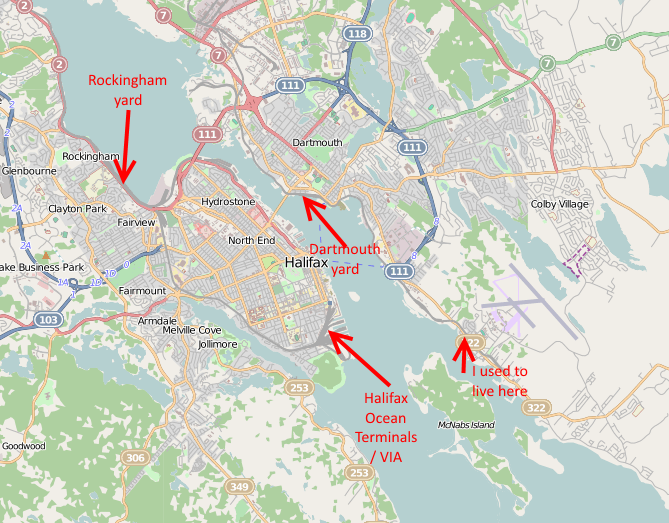 I always enjoy visiting Halifax. I lived in the area for 3 years... a bit over 35 years ago, mind you, but I remember it.